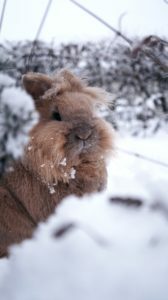 When the temperatures drops, most rabbit owners know the importance of checking that their pet’s hutch is winter ready. However, did you know it’s just as important to consider your rabbit’s emotional needs as well? Brave the cold to give your bunny a cuddle! An often overlooked problem for rabbits in winter is that they have reduced playtime with their owner. When the weather’s nice, you’ll often be outside even if you’re not specifically going out to see your rabbit. You and your pet will benefit from lots of regular visibility. However, in the winter when you’re not going outside as much, you and your rabbit will also be missing out on regular contact and this will have a significant impact on your rabbits’ health. Even if kept with other rabbits, they can still miss you and feel lonely. Brave the cold and get outside to maintain as much of their normal routine as possible. And remember rabbits are crepuscular meaning they are most active at dusk and dawn so even when it’s dark you can still pop out to see them, it’s unlikely you’ll disturb their sleep. As well as less playtime with their owner, less exercise is also an unhealthy side effect of the winter months. 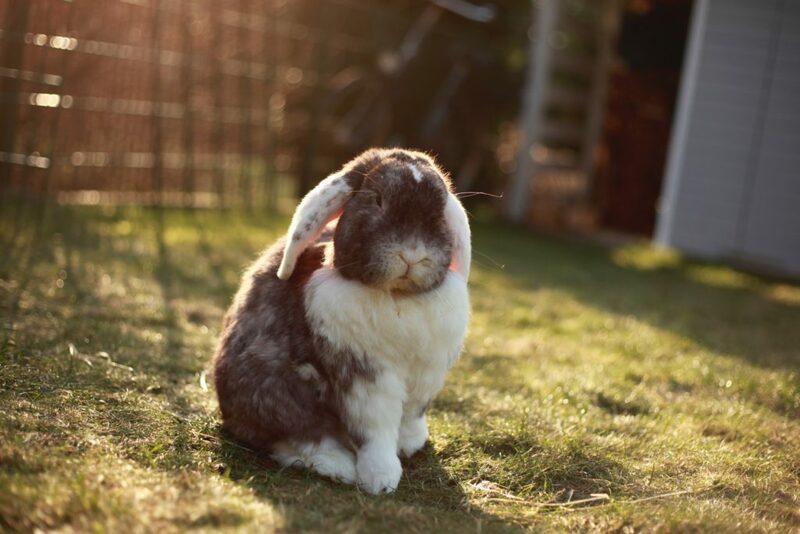 It is incredibly important you do all you can to avoid this affecting your rabbits’ health. Consider a hutch with a run attached so that your rabbits have access to space for exercise during the day. A large walk in run also makes it easier for you to play with your rabbit, as there is space inside for you to join them, and you and your rabbits can be protected from the elements by covers over the top and around the sides of the run. If your rabbits’ hutch is not attached to a run, the Zippi Tunnel System is an excellent solution to link these two together, and provide rabbits with easy access to a larger area for exercise when they choose. You can also open the run in the morning and close in the evening by using the door on the Zippi Tunnel entrance. Provide lots of dry bedding in their hutch and if your rabbit’s get really wet then you can dry your rabbits with a towel after outdoor activity. Check there is food and water available in the run, as well as a shelter and toys. You can even place some bedding in the run to encourage exercise when it is cold. In winter, ensure that your rabbits’ home is waterproof, dry and ventilated. 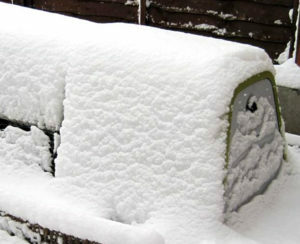 A common problem with standard wooden hutches is that they can become damp and cold from leaks and drafts. If you do have a wooden hutch, it is important to check the home for damp patches regularly. You will also need to remove any wet bedding promptly as this can freeze. Consider moving your hutch closer to your house, in a sheltered area to protect it from wind and rain and make it easier for you to check on your bunnies regularly. Provide your rabbits with extra bedding to keep them warmer during these colder months, and you may also want to purchase a safe microwavable heat pad to place underneath bedding if temperatures drop below freezing. Ensure your rabbits have access to clean drinking water at all times, as they will likely drink more in winter, and check this is not frozen on particularly cold days. As well as hay, provide your rabbits with some leafy greens as these may be in short supply for them in your garden at this time of year. Some owners bring their rabbits indoors for winter. This can be a great way to keep pets warm and healthy in the colder months, however, the process needs to be carefully managed. Moving your rabbits into a different habitat can be a stressful change, which should be done gradually. Remove all hazards and cables from ground level in the rooms which your rabbits will have access to, provide a dark sleeping spot, and place familiar items from the outside hutch into the home. We recommend seeking further advice from animal welfare experts such as the RSPCA or your vet if moving your rabbits indoors. If this is not an option for you, or if your wooden hutch is looking a little worse for wear, and not providing your rabbits with the warm, dry shelter, they require, consider upgrading to a insulated waterproof hutch, such as the Eglu Go, which offers complete protection against the elements. The Eglu Go Hutch has a unique twin wall insulation system which works in a similar way to double glazing to keep your rabbit’s home well insulated, while the draught-free ventilation system allows fresh air in without blowing cold air over the bedding area. The removable bedding tray can be slid out and cleaned quickly making it easier for you to meet your rabbits’ needs and maintain their dry living conditions. Click here for full terms and conditions for New Year, New Eglu promo.